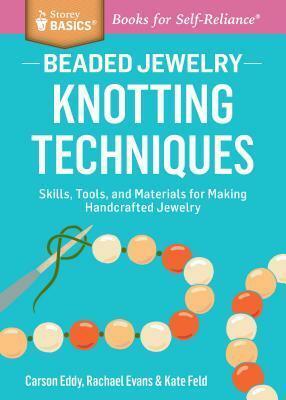 This is a complete introduction to making jewellery using knotting techniques, including evaluating, selecting, and caring for pearls and gemstones; the pros and cons of silk versus nylon stringing material; and selecting findings and tools. Step-by-step illustrated instructions show exactly how to knot between beads and attach various types of clasps and finishes. Create hand-knotted jewelry that shows off the beauty of pearls and gemstones while keeping them securely in place. With guidance from longtime bead professionals Carson Eddy, Rachael Evans, and Kate Feld, you'll select the appropriate cord for each project along with the necessary clasps, rings, and tools. Easy-to-follow illustrated instructions teach the knotting techniques that transform your designs into one-of-a-kind bracelets and necklaces. Carson Eddy is the owner of The Boston Bead Company, with stores in Cambridge and Salem, Massachusetts. The Boston Bead Company offers an extensive calendar of classes and in-store demonstrations and maintains an online resource center, beadOpedia. Co-author Rachael Evans has been a bead buyer, manager, and jewelry designer at The Boston Bead Company over the course of 12 years. Co-author Kate Feld has worked as store manager and is currently the staff designer of The Boston Bead Company.